I’ve heard you use the word vulnerable four times in the last ten minutes of you speaking. I notice it’s something that is starting to define you a little bit. Almost like it’s a personal brand. 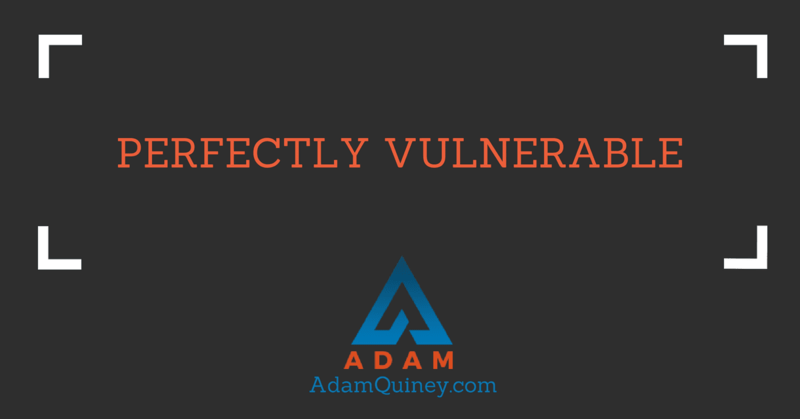 You’re the person that talks about vulnerability. In a way, it’s almost like a leitmotif — a particular piece of music that plays every time you make an entrance. It’s not really a bad thing to be associated with. In fact, these days, it’s quite vogue. I’m just left wondering when you’re going to stop talking about vulnerability, and start actually being vulnerable. Everything you share feels perfectly crafted. Your vulnerability, and your examples, are all touching, moving, clean. Safe. They have the same anti-septic smell a hospital does. I can’t feel a human heart underneath your words. I just feel someone doing a really good job talking about vulnerability. I notice how alluring it is. You seem to have figured out how to do this vaunted thing called vulnerability, and yet it seems so perfect and clean. Maybe if I follow you, I can learn how to be simultaneously vulnerable and untouchable. The holy grail really — the ability to do this awkward thing everyone is talking about, without all that awkwardness. But I also notice how boring it feels. Like most good marketing, I simultaneously feel drawn in, and repelled by the fact that I know I’m being marketed to. Or actually, it feels more like I’m being given a lecture. Like a parent telling their kids how they should be, without being willing to model that same thing themselves. It sounds great, and I believe you believe you’re really modelling this thing called vulnerability. I wonder if you can see how clean and tidy this game you’re running is. Then I notice I’m not sharing this with you. I notice that I’m resisting vulnerability myself, because I don’t want to bring this to you and have a conversation with intimacy in it. I’m worried about how you’ll respond. I’m worried that you won’t receive what I have the way you are supposed to receive it. And I realize that I’m doing the same thing you’re doing. Just my own flavour of it.